Performing all over the world as a soloist, David was previously principal horn of the London Symphony Orchestra and now holds the same position with the London Philharmonic Orchestra. As well as on many critically acclaimed solo recordings, David can also be heard on the soundtracks to many films including Star Wars and Harry Potter. David Pyatt was only 14 when he became BBC Young Musician of the Year. His subsequent solo career has taken him throughout the UK, as well as to Europe, the USA, Canada and Japan. He made his BBC Proms debut in 1993, and has reappeared many times since, at the Last Night in 2004, with his performance of Strauss 1 televised worldwide, and most recently with the BBC National Orchestra of Wales (John McCabe’s Rainforest IV) and at the BBC Chamber Proms (Brahms and Ligeti Trios). Having been principal horn of the London Symphony Orchestra since 1998, in 2012 he took up the same position with the London Philharmonic. David was named Young Artist of the Year for his recordings of the Strauss concertos and the Britten Serenade (EMI), while for Erato he has recorded the Mozart concertos with Neville Marriner and the Academy of St Martin in the Fields, horn and piano works with Martin Jones, and English music with Anthony Rolfe Johnson, Peter Donohoe and Levon Chilingirian. Subsequent recordings include Schubert’s Auf dem Strom for the Hyperion Schubert song edition, the Brahms Horn Trio with members of the Gould Piano Trio (Quartz) and Mathias’s Horn Concerto (Metronome). As a recitalist and chamber musician he has performed at the Amsterdam Concertgebouw and in the Carte Blanche aux Vents series at the Louvre, Paris. David's many performances at the Edinburgh Festival, include a recital to commemorate the 50th anniversary of the death of legendary horn player Dennis Brain. 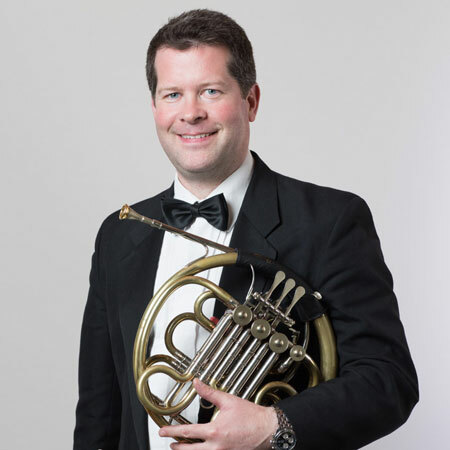 David is a Professor of Horn at the Guildhall School of Music and in 2013 was appointed to the same position with the National Youth Orchestra.